March 28, 2019, 6:04 PM · The next phase of Disney's interconnected Marvel Theme Park Universe has celebrated its opening at Hong Kong Disneyland. 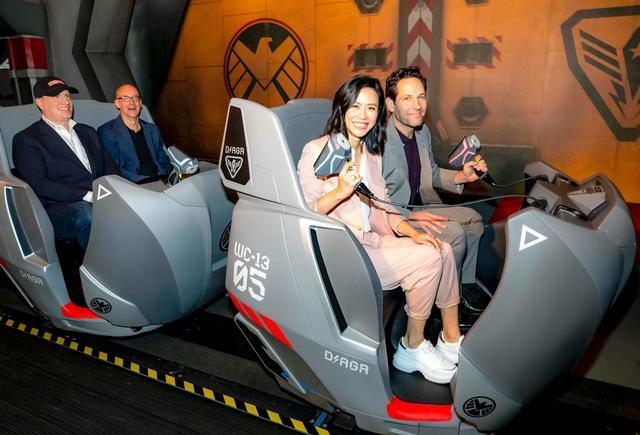 After the ceremony, Rudd joined Marvel Studios President Kevin Feige, Ant-Man and The Wasp director Peyton Reed, and Hong Kong actress Jessica Hsuan on the ride. Hsuan plays Leslie Lam, the Chief Engineer of the S.H.I.E.L.D. Science & Technology Pavilion, a new Marvel character created for the ride. We've got the latest details on the planned California Adventure Marvel land ride below. Not very impressed with that, unfortunately. Seems like a good time to me. A little on the dingy and monochromatic side though. I think that's one of the challenges and limitations of adapting Marvel properies into rides. The good thing is Paul Rudd is an actor. He can fake being impressed and enthusiastic about this attraction, which will be an afterthought by next week. I know not every attraction can be an E-ticket, but having two Marvel attractions, and neither being very impressive is kind of a lousy start for HK. Looks like a good overlay to me. Since we know Buzz LightYear was a slow-moving family-friendly ride this was never going to be hyper-manic or fast. It is what it is - and remains a family-friendly, people-guzzling C-ticket ride. Every park needs them and I think it's a good re-purposing of the old ride. You've got to be kidding me. This may be one of the least imaginative ride concepts/designs I've ever seen. It's hard to imagine a less inspired overlay making use of the Marvel Universe IP. Have to go into the underwhelming line on this one. Not terrible but you'd think it would be more for HK and Disney combining.